Dignity of labour Essay. Welcome to our website. This is the one of the best and an unlimited the source of Essay and Paragraph. 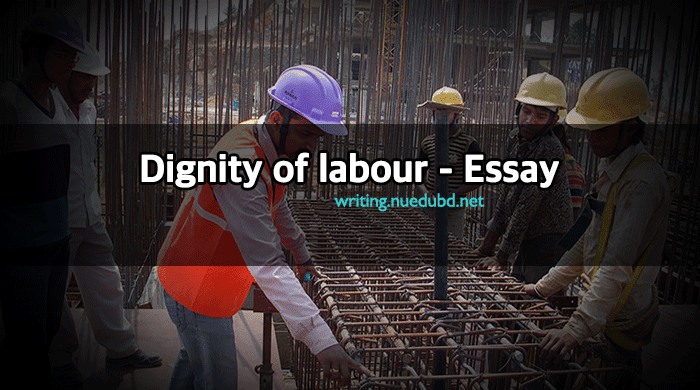 Now NU EDU BD writing section sharing the most useful Dignity of labour Short Essay for you. I hope you'll like it. Education is one of our basic rights. This is very short and easy essay for you. Now check this out Short composition on Dignity of labour Essay for you. Introduction: Work is life. the man has to work to sustain his living on earth. To get success in life, work is the main medium. thus, we have to work hard to keep our existence. And labor has much dignity and honor. Labour and mentality: We have to work. We should not avoid it. some people hesitate to work. They think it demeans their dignity. The rich men hate it. They forget that their riches are the results of someone,s work. Thus we have to divert our mind to labor both physical and mental labor. We must be sincere in our work. Importance of labour: The world is a great worktop. Labour is life and life is labour. Labour is the source of all success, prosperity, and progress. The man has to work for own livelihood. None helps us to keep us alive. We have work. This work can survive us. Thus the importance of work is immense. This labour has helped man to develop hid civilization. All the essential ingredients of developed civilization have been possible because of labour. The cities, towns, large buildings have been erected by means of labour. Labour in personal: In personal life, labour brings a huge profit. An active man succeeds in life. He can reap a good harvest. he does not depend on others. He gets many pleasures when he gets his harvest. This harvest can transmute him to the zenith of riches. Thus the dignity of labor in personal life is great. Labour in social life: In social life also, labor has many benefits. If the people living in a society work, there will create a prosperous society. A labourless society will perish Thus labor in society can bring dignity to everyone living there. LAbour in developed countries: In developed countries, labor is given higher dignity. These countries have occupied the highest position by means of labor. The people of America, Russia, Japan, Garmany do not underestimate any type of labor. The students in these countries do not hesitate to do inferior work. Labour in our country: We are very adverse to both type of work. We do not know the dignity of work. our educated people deem physical labor prestigious. They think it disparages them. We can not take any work cordially. As a result, we are still in poverty. To get rid of this we have to value work and must do it sincerely. Effect of idleness: Labour has much dignity and honor. No work is despicable.man can get excellence in every field by means of labor. An idle man can not in life He has to depend on others. He becomes a burden to others. He leads a very miserable life. Idleness begets depression, frustration, and failures. They bring their own ruins and destruction. Life of prominent personalities: The lives of the prominent personalities are the instances of hard labor and industry. They earned name and fame as they valued work. All of them were sincere and hard working. Our prophet, Hazrat Mohammad (SM.) worked physical labor. Vidyasagar becomes a porter to carry the bag of a young man. The intellectuals and scientists have become memorable because of their labor. Our duty: We have to work hard we should use our time we must not neglect or abhor any type of work. We have to give the dignity of labor. in this way, we can get success in life. Conclusion: Human life is impossible without work. It is meaningless without labor. We must work because our life is not a bed of roses. To survive here, labor is necessary. We have to realize the dignity of labor. We should always understand that labor is life.